The EIA says that California leads all states in distributed solar power with about 40% of the total. Arizona is ranked 3rd and Hawaii is ranked 6th. The popularity of rooftop solar in California and Hawaii correlates with the fact that both states have well-above-average electric rates. They also get more sunshine than many other states. The Pew research shows that homeowners consider both the financial benefits and environmental benefits when thinking about installing solar systems on their homes. 90% said they have installed or considered home solar panels in order to save money on utility bills and 87% say they did so to help the environment. 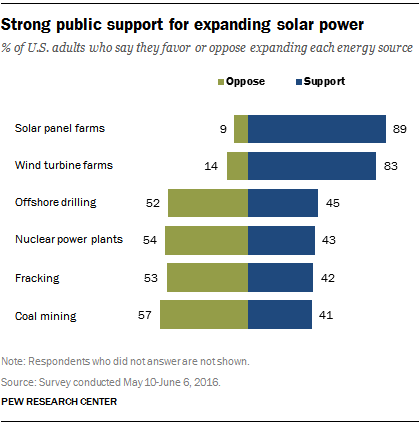 An interesting finding is that only 60% said that the solar investment tax credit was a factor in their deliberations about solar power. Perhaps that is because many solar companies roll all incentives into the final cost of the systems, so people are not directly aware of the federal 30% tax credit. If Donald Trump was really interested in making America great again, he would be advocating for a massive increase in installed solar power so American industry could benefit from lower energy costs and a faster-growing economic sector. That would make American made products more competitive in global markets. Instead, he is worried about protecting fossil fuel companies that pollute our air, water, and land. Republicans are always bleating about how we can’t afford more solar power. The truth is we can’t afford not to greatly expand our solar power facilities so that our children and grandchildren can grow up in a world that promotes healthy living.